If you have ever played basketball, tennis, volleyball or even walked on an uneven sidewalk, you may have been a victim of an ankle sprain. With almost every sprain there is an ominous “pop” or significant bruising. For the 25,000 people who suffer from an ankle sprain each day in the United States alone, it is possible that the popping sound or bruise that covers the entire outside of the foot may be a fracture instead. Unfortunately, the things we subconsciously hold synonymous with a sprain can also happen with a fracture. Although there are many variations of a fracture, the definition is quite simple. It is a break or interruption in bone continuity. But what exactly is a sprain? An ankle sprain isn’t as straight forward as a fracture. It involves some level of damage to a ligament, whose role is to support the interaction between two bones. The damage can be a partial tear, complete tear or stretching of the ligament. This results in pain and instability of the joint. Can you walk on a broken or fractured ankle? It may be possible to walk on minor breaks so do not let this be a determining factor as to whether or not you have a broken or fractured ankle. Additionally, in both fractures and sprains, you can have pain, swelling and bruising. For those of us with an x-ray machine or an MRI handy, it can be fairly easy to discern between the two. But how do you know the difference without advanced imaging or x-ray vision? The main function of a ligament is the stability of the ankle, they are mostly stressed in side-to-side movement. Most people with an ankle sprain can walk or, at least, place weight on their foot without significant pain. There are always outliers to this generalization, but the pain level with a fracture is going to be much higher, especially when placing weight on that area. The ankle is made up of the fibula (outside bone), tibia (inside bone) and the talus, which is the part of the foot connected to the ankle. Although ligament injuries can cause pain at the edges of those bones because it is where they attach, a fracture will have pain in a much larger area. Pressing upwards along the ankle bone is not going to commonly produce pain in the setting of a sprain. Be sure to also check the 5th metatarsal bone, which is located on the outside of the foot. This is commonly fractured during an ankle sprain, but also easily missed. Swelling is common in both a fracture and a sprain, but a fracture results in a piece of bone becoming unstable from the rest of the bone. In most cases the surrounding soft tissue provides enough support to keep the bone in place. In some instances, the fractured piece of bone is moved out of position. This results in a protrusion of bone which can be visually evident on examination. Similar to swelling, bruising accompanies almost every ankle sprain and fracture. 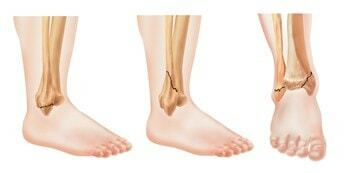 Ligaments tend to be located at the tips of the bones in the ankle. Because of this, any bruising will be located around the tips of those bones. Bones are very vascular, meaning they have a lot of blood flow, which results in more bruising. A fracture that occurs at the tip of the bone can have similar bruising patterns, but many fractures occur higher up the leg. The resulting bruising can be seen extending higher up the ankle. Pain is likely to accompany both and ankle sprain and fracture. With appropriate treatment of rest, ice and compression most ankle sprains have significant decrease in pain after the first week. If your pain continues beyond that point, there is a higher likelihood that a more extensive injuries is present. Not all ankle sprains or fractures will apply to these general rules. Certain ankle sprains can require extensive treatment and longer recovery time. Because of this, it is always critical to have prompt evaluation by a physician, which can result in early proper treatment, quicker recovery and better long- term results. The team of experts at UFAI are nationally recognized experts in the field of foot and ankle care. They have decades of combined experience and pride themselves in offering the best and most advanced care. If you have suffered an ankle injury or have any questions regarding foot and ankle care, we encourage you to call us at (877) 989-9110 or visit us at www.footankleinstitute.com. I like how you mentioned that being unable to put weight on your foot can indicate that it’s a fracture, not a sprain. My daughter injured herself while playing soccer, and we thought it was just a sprain. She hasn’t been able to put weight on it for a while now though. You have convinced me it would be best to visit a professional and see if it’s a fracture. Thanks! With my ankle fracture I could not walk and the ankle ligaments hurt a lot. Thanks for the post. My cousin moved-in with us while he attends school this semester, which has not started yet. Last week he sprained his ankle playing basketball. It hasn’t healed yet and he has bruising higher up the leg that seems to be extending up the ankle like you described. We better have him see a doctor to check if he fractured his ankle and not wait for school to start to see a doctor there. Thanks for the advise, very helpful. I still can’t put weight on my foot and it hurts,yet my doctor said it’s a MILD sprain. I’ve had a severe sprain before, and this hurts just as bad, if not worse. Help me please … so I can stop worrying..
My Son (23) was beaten down, socked, kicked and stomped on 1 month ago.. by 3 large older men. His (R) outer ankle bone was very painful and severe swelling…… 36 days the swelling is much less, but the mobility – range of motion is not at all like his left ankle. As his mother nothing had been done… We have medical insurance and I have now begged for my son to have MRI and X-Ray….. he is in jail for using “pepper spray” in self defense…. has many disabilities…… What to do?? The Fresno County Jail is ignoring this injury. I am so very sorry to hear the condition of your son, that is terrible. We are not lawyers so we cannot be of help in getting his physical paid attention to. A good lawyer seems like job one, you need a good and strong legal advocate for him. In regard to his physical condition, stick to your “Mama Bear instincts” in getting his condition looked at. You need to find a local foot and ankle doctor for him to be cared for once he is out. I do not know if any of our doctors know anyone up in your area, but if you want me to ask, I most certainly will. Please let me know. In the mean time, please stay strong and do not stop fighting for your son. I fell from some steps about 1 month ago sprained my right ankle. I have no insurance I still feel pain and I feel some weird pulling feeling wondering if that’s normal to feel. Seriously, please take care of yourself. I hurt my ankle about a week ago playing soccer, and I feel like it’s not getting any better. You mentioned in the article that an inability to place weight on my foot when standing could be a sign that my ankle is fractured and not just sprained. It has been a week and I still can’t put pressure on my foot yet, so would you suggest I see a podiatrist as soon as possible? No offense intended, but why are you writing what you should do to take care of yourself on a blog instead of taking care of yourself and getting yourself checked out? This is really a message to anyone reading this, if you are fortunate enough to have insurance or the means to see a doctor if you are injured or in pain, please do so. You are responsible for your own welfare, so do the responsible thing. Nuff said. Okay, just looking to make sure this is only a strain or sprain…so 10 days ago, I twisted my ankle really bad. It swelled up pretty bad and three days could not put any pressure on it at all. It bruised on both sides of the ankle and clear up into my toes, which I still can’t move at all without pain. I cleaned house today gimping around and guess what, the bruising got bad again and it swelled up even more…is that normal for a sprain or strain? Without seeing you, it is impossible to tell you what is really wrong. Under-treated sprains are a leading cause of more serious foot and ankle conditions, so it really is better to be safe than sorry. If you follow the standard post injury protocol of rest, ice, compression and elevation and it still hurts after a couple days, GO SEE A DOCTOR! I had surgery in 2009 on my left ankle but still suffer great pain in both ankles. The surgery was to “clean up damage to an ankle sprain.” One X-ray showed what a podiatrist called “gutter clutter.” I can’t seem to find a good ortho doctor that specializes in ankle conditions in my small southern Illinois area. I would like to be able to dance again. I want relief! I am very sorry to read about your condition. We cannot help you find a doctor in Southern Illinois, but we might be able to refer you to someone in Chicago. If that will help you, please send an email to webhelp@footankleinstitute.com and ask for any docs we know up North. I twisted my ankle about 9 days ago. I have almost no pain walking now, and I don’t see any signs of swelling. I’ve returned to my office job, but I am still trying follow RICE as much as possible. I’ve noticed that I started getting more bruises around the joint area on the lateral side. Is it a sign of the sprain getting worse or a normal healing process? Thanks for dropping a note, and please do not think this answer is a cop-out, but we cannot give medical advise when we cannot see the patient. Especially in this situation, as it could be things are fine or they are not, and without seeing you, there is no way to know. I would say the best recommendation I can give is if there is doubt, check it out. But you are very wise it seems following the RICE protocol. Good work! We are so glad! Thank you for letting us know. Be well. The question is not really “is it healing” but is it healing well? For this, you need to see your doctor. Only can they tell you for sure once they can see you in person. Better safe than sorry. I hope this helps!